Dads. They’re often embarrassing, soppy, strong, proud, stern, protective, all-knowing…but we love them. With Father’s Day approaching, why not tell us why you think your Dad is the ultimate and the best so you can treat him to a slap-up breakfast of champions with a selection of our yummy spoiltpig goodies. 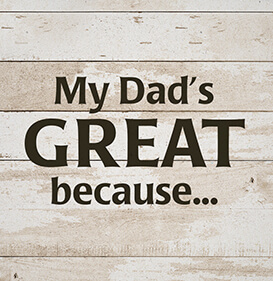 Nominate your Dad by simply completing the sentence ‘My Dad’s the best because…’ in no more than 5 words on our promotional posts on Facebook, Twitter or Instagram. We’ll pick one winner at random on Monday 12th June to win spoiltpig goodies, delivered in time for his big day. Show Dad you love him and feed him up with spoiltpig on Sunday 24th! 2. Promotion Period: The promotion will run from 08:00 on Wednesday 7th June 2017 until 23:59 on Sunday 11th June 2017. 3. To Enter: visit the spoiltpig Facebook, Twitter or Instagram pages and complete the sentence ‘My Dad’s the best because…’ in no more than 5 words on the promotional post. Entrants are required to ‘like’ the post. 5. The Prizes: 2 packets spoiltpig smoked back bacon, 2 packets spoiltpig unsmoked back bacon, 2 packets spoiltpig smoked streaky bacon, 2 smoked spoiltpig gammon steaks and 2 spoiltpig unsmoked gammon steaks. Only 1 prize available. 8. Prizes will be despatched within 2 working days of address confirmation.